True story. And one we at The Urban List stick too. We’ve therefore compiled a list of the world’s best dog friendly hotels so you too never stray far from your four-legged friend. You’re probably already familiar with The Langham, if not from attending than from puzzling over the finer nuances of its pronunciation. And while it may seem far too fancy to possibly accommodate your four-legged friend, we have good news. They totally do. In fact, The Langham Sydney offer a pampered pets program meaning your pooch will get the same world class service you’d expect for yourself. We’re talking high-class dishes, gourmet treats and… lawdy we hope they want to come home with you afterwards. The Langham is the only luxury hotel in Sydney to welcome pets (under 20kg) and also offer dog walking and sitting on request (you can’t leave them alone in the rooms which is more than understandable). The Peninsula is just as fancy and quintessentially French as you’d expect. A hop, skip and a jump from the Arc de Triumph and smack-bang in the heart of Paris, The Peninsula is one of those places where you’ll look around and say, ‘Am I really here?!’. And you know what would make that moment even better? A doggo. Dogs under 13 pounds (around 6kg) are welcome and while that means your St Bernard Great Dane mix may have to stay home, you can bring multiple smaller pups and there’s no fee. Dogs will receive a welcome basket of dog food, water (Evian of course), a toy and tag upon arrival. We recommend a terrace suite so everyone can enjoy the view. There’s just so much good stuff going on at Hôtel le Cap Estel we can hardly contain ourselves. They have their own two-hectare peninsula you guys. It reaches into the Mediterranean Sea, has panoramic views and you can bring your dog. Is this what they sing about in the love songs? If you can peel your jaw from the floor, let’s turn our attention to pets. Dogs will receive a welcome basket upon arrival as well as a super spesh three-course meal from the hotel’s Michelin-star restaurant. If you’re not taking them for a paddle, your pal is welcome in the gardens, cinema and the library. Guests can purchase a personalised cashmere jumper with their pet’s name printed in rhinestones. Follow it up with a day at La Domus Aventina, a nearby pet spa, for a shampoo, massage and brush and life made. Life. Made. Three words: miniature dog robes. Hooked? We knew you would be (we’ve been unable to think about anything else tbh). Located on the Italian coast, the Belmond Hotel Splendido in Portofino, Italy offers dog massages, a special room service menu, grooming appointments, and a dog walker. Guests can also request in-room amenities like water and food bowls, toys, and kennels. We don’t known about you but we totally get why they’re called ‘Splendido’. P.S. The Dolce Vita, Presidential and Ava Gardner Suites might just be the nicest lookin’ rooms we’ve ever seen. We’re barely halfway through this list and yet our excitement keeps on rollin’. Next to spike our adrenaline: Park Hyatt in Midtown NYC. 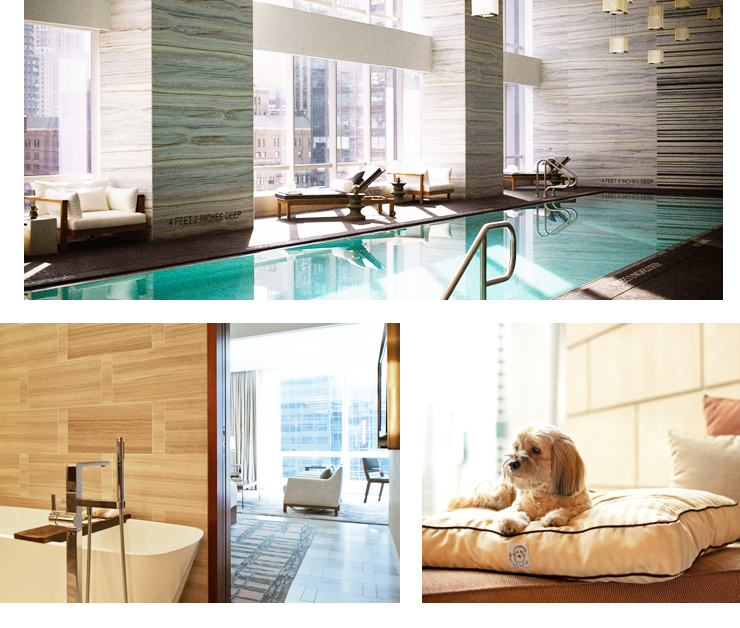 A breezy two-block stroll from Central Park, Park Hyatt allows dogs 50 pounds (22.7kg) and under and offers a very special VIP pooch package. Developed by Amanda Hearst and Friends of Finn, the package includes exclusive access to seasonal pup fashion (by Barneys Fashion Office and Love Thy Beast), Nesbit treats, an I.D. tag with the hotel’s info – so clever – a dog bed, rain gear, paw wipes, waste bags, food/water bowls and a Kong treat-dispensing toy with all-natural almond butter. The Park Hyatt will also donate $100 USD from each package to the Humane Society. Thanks guys! If you’re not new to the world of dog accommodation then you may have heard of Ashford Castle in Ireland. If not, we’re pleased to tell you it’s as simple (and glorious) as this: they allow dogs of all sizes. Four-legged pals will be treated to a comfy duvet, food and mineral water (only the finest for Fido), and a turndown treat at bedtime. Grooming, sitting and walking services are all available as are leashes and doggie first aid kits. The grounds at Ashford Castle are also bloody HUGGGE (that’s a scientific term, yes), which is sure to please. You’ll incur a €40 fee per dog per night but totes worth it. We’re pretty sure the grounds at Clivedon House have been used in possibly every Keira Knightly movie ever. It’s that kind of beautiful. Let’s welcome you and your dog to that bliss shall we? Can’t have Keira hogging it all. Surrounded by over 250 acres of dog-friendly walking trails, Cliveden House offer a pet package for £35 per night with services like a welcome pack overflowing with treats and deluxe dog bed. The hotel also offers an in-room dog menu so you don’t need to worry about toting in your own. If you didn’t already think Switzerland was a cool place to visit – snow, mountains, the occasional Skarsgard – then feast your eyes on Gstaad Palace and get ready to book your tix. A glamorous hotel, Gstaad Palace has ahhh-mazing views of the Swiss Alps, indoor and outdoor pools, tennis courts, and one fine pet package. Your pooch will receive two water bowls, a pillow, personalised welcome card (who’s been a good boy?! ), dry food and à la carte options like carrots, rice, chicken, or beef. They also have dog-sitters available by request and a 24-hour complimentary dog-walking service. Not that you’ll need that last one, with all the hikes and outdoor activities Switzerland has to offer, you’ll find yourself inside only to recharge. OPUS view themselves as a place where “hotel meets lifestyle”. And since our lifestyle is begging people to let our dog come along, we fit right in. Guests will receive a dog tent, bowl and treats and a complimentary dog “break” i.e. walkies. The special Pampered Pooch package is also available for you and man’s BFF with a locally made dog collar, in-room, one-hour massage and homemade treats. You can add on an in-room photo shoot with a bona fide pet photographer for an extra momento of your stay. Yes. A personalized photography session for your pet is a glorious possibility (not that your phone isn’t full of them). Located in Beaver Creek (ah, Colorado), The Ritz-Carlton Bachelor Gulch is exactly what you’d picture if we said ‘rustic ski lodge from an American rom-com’. And boy we’re excited by it. The dog-friendly hotel offer a ‘Bachelor’s VIP Pack’ - inspired by resident St Bernard Bachelor - to all four-legged guests (and dogs too! Ba dum tsh!). That means all-natural pet food, room service, special treats, doggie massages and bath treatments. Overstuffed beds, premium dog bowls, toys, plus a guide to local dog parks and canine-friendly restaurants are also up for grabs. We’ve saved the best for last folks. Las Ventanas Al Paraiso offer Pet Cabana rental so you and your dog can rest in comfort at the pool or beach as you (see: just your pupper) sample from the Canine Delights menu. If that weren’t enough, you can also rent your pet a dog butler to take them on walks (beach or desert countryside today ma’am? ), give them massages, lead dog yoga and, wait for it… organise dog birthday parties. Prepare yourselves for a truth bomb: there’s more to the Napa Valley than wine. We know! It’s crazy but there’s also loads of biking and hiking trails, hence why we recommend bringing your resident bow-wow. Located in the Oxbow District of downtown Napa, the Westin Verasa Napa is within walking distance of a dog park, riverfront path, and several other trails. When you’ve had your fill of pavement pounding, head back to the room for a custom-designed luxurious dog bed, pet accessories and treats. And before you ask, yes. There are dog-friendly wineries. Hotel staff can help you out. P.S. doggos must be 40 pounds (18kg) and under unless a service animal. Located on Shelter Island in San Diego, California, Kona Kai Resort and Spa is the ultimate holiday destination thanks in large part to the fact you can bring a dog of literally any size (once you cough up a few dollarydoos that is). Under the IslandPaws program, your pet will score a pet bed, water and food bowl, welcome treats, in-room dining service, mobile grooming and a special pet exercise area. You’ll score drinks, sun and the feeling of knowing your dog isn’t missing you. Priceless eh? We can hardly contain our excitement ‘cause Cypress Inn has a legit, we-kid-you-not Director of Pet Relations. Okay fine. Her name is Sadie and she’s a Chihuahua in a red turtleneck sweater. Still totes excited tbh. Pets are welcome in Cypress Inn’s living room for afternoon tea or in the charming courtyard for breakfast and evening meal (while leashed) as well as rooms, a rarity among pet-friendly accom. You can also book a pet sitter as needed, not that you’ll need one much, Carmel Beach is great for dogs and super close. P.S. You can thank co-owner Doris Day (yes, the Doris Day) for Cypress Inn being so pet friendly. The Mandarin Oriental Miami may seem pretty standard at first glance. Room service menu with all-natural pet cuisine? Check. Treats and bottled water at check-in? Double check. But wags at the ready, ‘cause their specialised pet packages really set them apart. You can book a certified dog trainer for a brush-up on skills, a play date with pet butler or even, a copy of the book Marley & Me by Josh Grogan (filmed in Miami after all). P.S. If you’re not dying with cuteness at that last one… you got some ‘splaining to do. Once you're done here, check out our guide to Sicily.